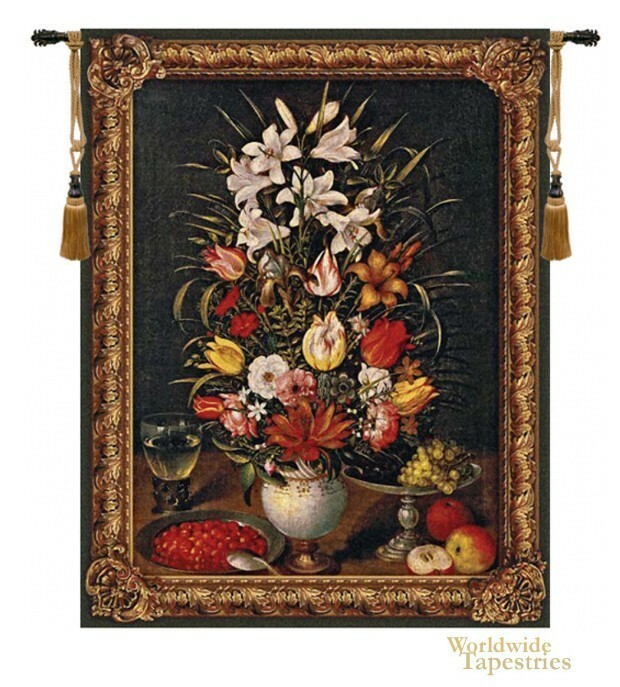 Antique Breughel II tapestry shows a beautiful floral composition, the work of Jan Breughel (1568-1625). The Flemish painter, from Brussels, resided in Naples then Rome and painted landscapes and flowers. A variety of blooms in reds, mauve, yellows, burnt orange and creams are seen in a vase, beside an arrangement of fruit including apples, grapes and cherries on the table. Olive foliage adds to the warm color palette. The dark background helps to accentuate the colors even more. There is a gorgeous lavishness to this work which is most unique and is a hallmark of the work of Breughel. This Antique Breughel II tapestry is backed with lining and tunnel for easy hanging. Note: tapestry rod and tassels, where pictured, are not included in the price.